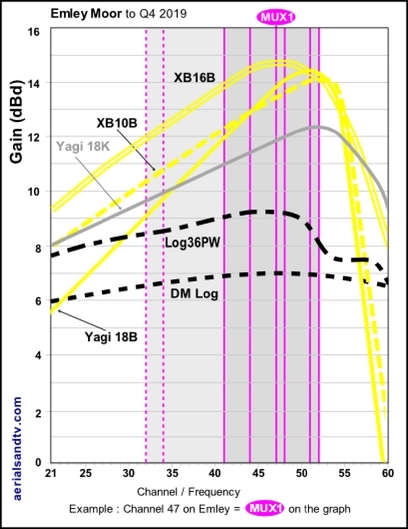 For Emley Moor we recommend the DM log for strong signal areas, the Log36 or Yagi18K for medium signal areas, the Yagi18B for outdoor installs in poor signal areas, the XB10B for loft installations in poor signal areas, and the XB16B for those with the most marginal signals. Unless you have a massive loft we`d normally recommend an XB10B for loft installs (over an XB16) due to smaller size of the former aerial. The dimensions and test performance of the aerials can be found on the relevant tables. Emley Moor`s population coverage is the fourth highest of any UK transmitter at about 4 million people and its signals are received in many large towns/cities including Sheffield, Leeds, Bradford, Huddersfield and Doncaster. 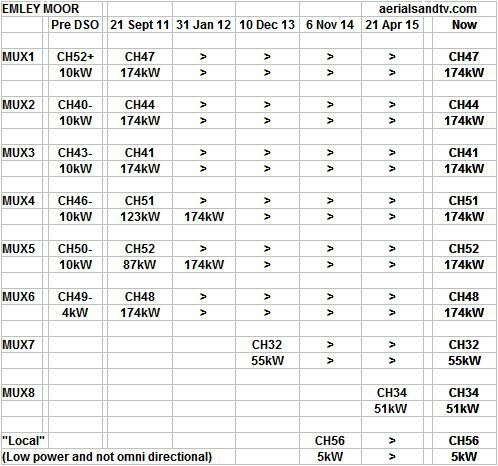 There is one ”Local” channel allocated to Emley Moor, CH 56 (which is more or less within the B group) for a Leeds local TV station. It must be admitted that at CH56 a B group may be a little down in gain on some widebands, but it should still be working reasonably well up there. This may not apply to some cheap crappy B group Contract aerials. In addition, there are two lower power HD MUXES transmitted (in the CH 31 to 37 gap) on CHs 32 and 34. Both of these channels can be picked up by decent B group aerials. it is due to remain a B group (excl MUXES 7 & 8). The Leeds local CH will go 56 > 39, which is better for the B group ! Emley Moor tower is the tallest free standing structure in the UK at 328m (a.g.l), that`s 1084 ft. The Shard (2012) is “only” 310m high. Incidentally, how high is high ? And how long would it take for a spanner, dropped off Emley tower, to hit the ground ? ! ? The very first Emley Moor transmitter was a 125m steel lattice tower* built in 1956 to broadcast ITV on the old 405 line VHF system. As such it worked in tandem with the original Holme Moss mast, which transmitted the BBC channel on VHF, only one programme remember because BBC2 didn`t start till 1964. Duplicated transmitters were/are also used at Sutton Coldfield / Lichfield, Crystal Palace / Croydon and Pontop Pike / Burnhope amongst others. BBC2 started 625 line UHF transmissions from the second (ill fated) Emley mast in 1967. As a matter of interest the short lived 1966 mast (see below) never transmitted BBC1 at all and only transmitted ITV on VHF. * This 1956 structure was rebuilt at Craigkelly in 1971 to provide UHF TV to SE Scotland. The present Emley Moor tower started transmissions on the 21 Jan 1971 and it is an elegant tapered concrete structure. In fact, to many people, Emley is iconic and fully deserving of the Grade 2 listed status it received in 2002. Just like the previous transmitters it is situated about half way between Huddersfield and Barnsley. This area of high ground is perfect for RF (Radio Frequency) transmission and both Holme Moss and Moorside Edge transmitters are visible (SW and WNW respectively) from the site. 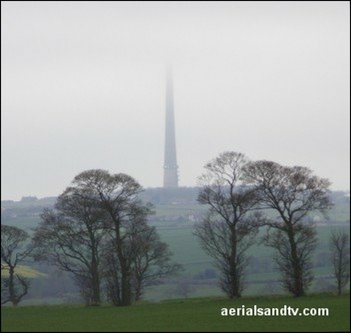 Emley Moor was originally owned by the ITA (Independent Television Authority) then it was sold off to NTL and finally to Arquiva (sic). Emley is a powerful transmitter, in fact it`s the the 6th most powerful transmitter in the whole of the UK. Note the huge power increase after the 2011 digital switchover. Emley Moor is a B group and all aerials on it should be horizontally polarised. You can confirm if you are on Emley if you receive your local Calendar news from Leeds, rather than from Hull (which would be from Belmont). Ofcom report Emley`s digital output as being essentially omnidirectional, which is somewhat surprising because there are hardly any people living to the SW of it ! 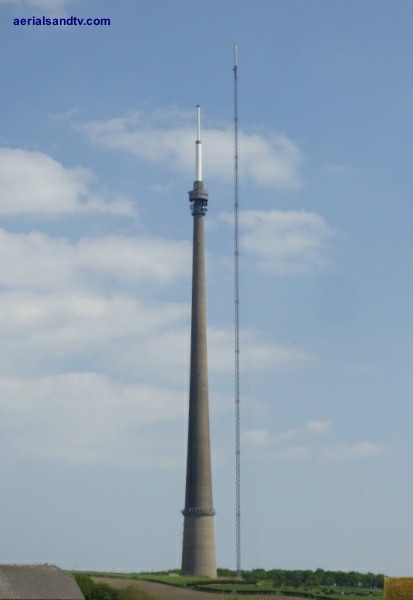 Emley Moor has fifty six (including Sheffield and Chesterfield) small repeaters to improve its signal coverage, particularly in the hilly areas of the Pennines. This picture was taken from near the National Coal Mining Museum which is definitely worth a visit, and it`s free ! Emley Moor television transmitter, all 1084ft of it...... The structure may look solid* but according to someone who works there it sways in the wind and this can sometimes induce sea sickness to those working in the microwave link room when gales are about ! Incidentally the structure is designed to withstand winds of up to 150 mph. 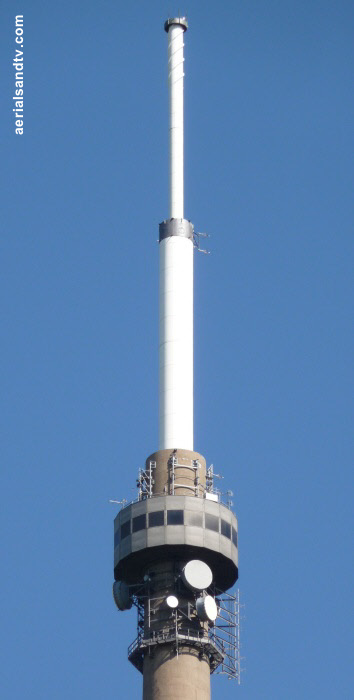 See Emley`s height in relation to other transmitters, and Emley v Belmont v Taipei 101. The ring marks in the concrete will be noted, this is where the shuttering was used to build the structure. Because the tower is tapered the shuttering`s diameter had to be reduced each time a new (higher) section was added. The whole structure weighs 11,200 tons. Note that Emley Moor is not a “mast” because it`s a self supporting structure, it`s actually a “tower”. Masts are cable stayed, like Winter Hill for example. Top of Emley Moor transmitter showing the microwave link room, also note the spiral structure at the top to deflect wind upwards. Emley Moor transmitter from Shelley station on the Kirklees Light Railway. The latter is a 15” gauge line built on the trackbed of the ex branch line to Clayton West which was originally built by the Lancashire & Yorkshire Railway in 1879 but closed in 1983. The KLR was opened in stages from 1991 to 1996 and the loco shown is Hawk which is an 0-4-4-0 articulated engine built in 1998. The three of them are pictured in scale, more or less, on the right. Until the Burj Dubai (828m) was completed in Jan 2010 the Taipei 101 in Taiwan was the tallest building in the world, and it`s bleedin` huge. My wife and I went up it and unsurprisingly the lifts are the worlds fastest (at 38mph..) and it only took 37 seconds to get to the 89th floor ! and How High Is High ? Incidentally we only went to Taiwan because we got a cheap flight to Australia via Taipei and we broke the journey there, but we really liked it. It`s a fascinating country (a cross between Japan and China ? ) but the best thing about it is the people have got to be some of the friendliest I`ve ever met. It`s like a huge National Trust property in that everyone is so nice to everyone else ! The channel guide below also includes the same data for Bilsdale, Belmont, Waltham, Sutton Coldfield, Chesterfield, Sheffield, Idle, Keighley and Beecroft Hill. This information can be useful for suggesting alternative transmitters should Emley prove problematic. Also check Emley Moor`s fifty six small repeaters. A temporary 310m mast was erected to May 2018 to enable transmissions to continue whilst the existing mast`s antennas are being modified to prepare for the 700MHz clearance and interruption of the broadcasts are not allowed. The planning application is here c/w plans etc. See picture, plus this this MB21 link. Emley Moor`s post 700MHz clearance graph. The dotted lines are MUXES 7 & 8, relatively small audience lower power HD MUXES which are due to be switched off between 2020& 2022. 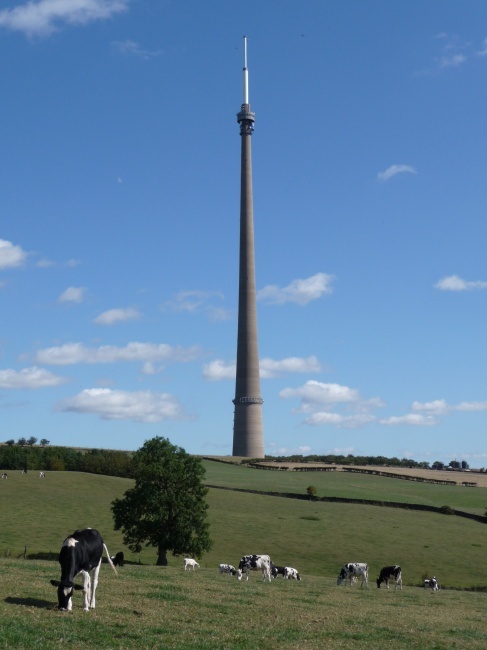 A temporary mast has been erected at Emley Moor (between May 2017 and May 2018) in order to allow the 700MHz clearance work to proceed on the original tower`s transmitting arrays without interruption. It`s due to be up for about 5 years. The power output is due to be the same as the original mast, but the radiation pattern is actually due to be more omni directional than the old one ! A temporary mast is also planned for Pontop Pike transmitter, and, during the digital switchover, a temporary transmitter was also used at Sutton Coldfield, amongst other sites. Also see the planning application and MB21 pictures.